Imperial Sunset is a moderate level complexity simulation of the largest naval battle in history, the Battle of Leyte Gulf. 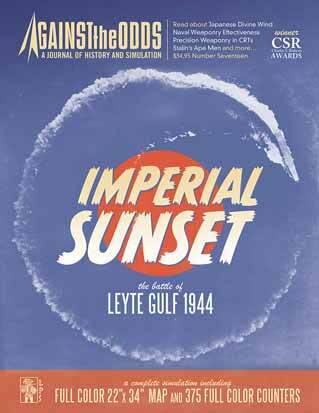 The battle was fought from October 23-26 1944 as the US returned to the Philippines, landing on the island of Leyte. The US Navy and the Imperial Japanese Navy fought a series of actions that collectively have been recorded as the Battle of Leyte Gulf. The historical result was a decisive defeat of the Imperial Navy, virtually eliminating it as a viable force for the remainder of the war. For the US Navy, it was a victory that was almost squandered due to command problems. Each game turn is six hours; there are three day turns and one night turn for each calendar day. Each sea hex is approximately 25 nautical miles across. The game map is used for all Task Force movement and movement by air units. 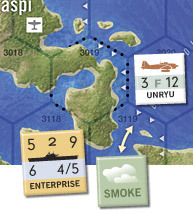 Two tactical displays are included, one for naval surface engagements and one for air attacks.